Disclosure: I was compensated by Canadian Turkey for this post. All opinions and experiences are my own. The spring season has finally arrived and we can all take a big sigh of relief that for the most part the cold and snow is gone for quite a few months. With the warmer weather many occasions spring up to gather with our family and friends. 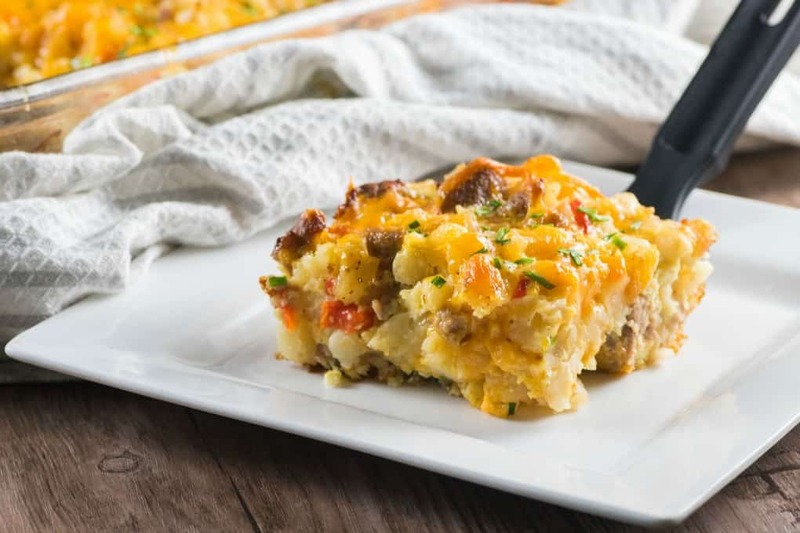 And with that easy meal prep is always welcomed like with this simply delicious Turkey Sausage Hash Brown Breakfast Casserole. 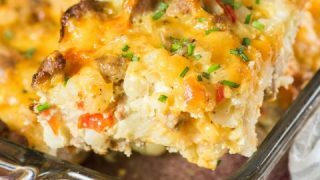 A casserole like this is perfect for Easter, Mother’s Day, Victoria Day, Father’s Day, communions, confirmations, graduations and birthdays!! A lot of our spring and summer celebrations include having a meal for brunch. Canadian Turkey can help you make a show-stopping meal. I love serving a turkey for a big celebration as there are always leftovers to enjoy but you can use turkey so many other ways too. 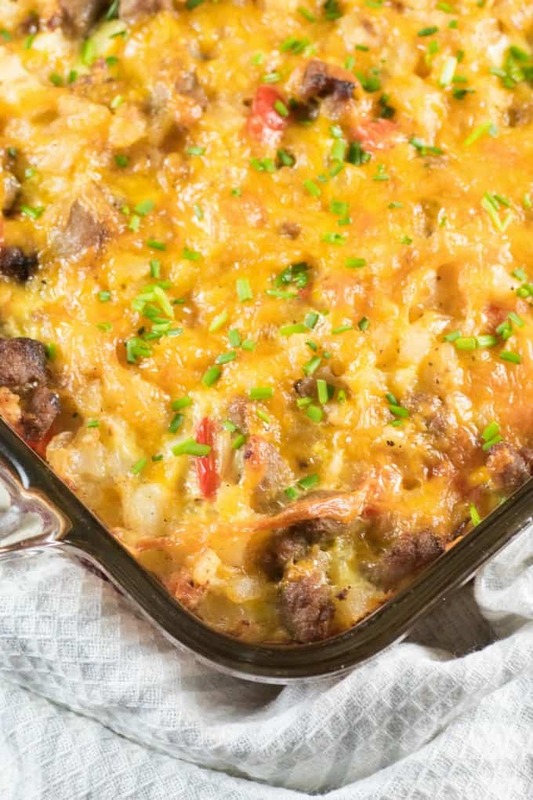 Subbing in turkey sausage in this casserole really cuts down on that greasy feeling that you can get with other sausages. Plus it is scrumptious too!! I have made a similar casserole but because it is meatless, it is more of a side dish. Adding in turkey makes this a full meal. Getting yourself organized and keeping menus simple will allow you more time to mingle with your family and friends. No one likes to be stuck in the kitchen when everyone else is visiting and chatting. The host should be with the guests and enjoying herself/himself too. Simple fresh ingredients with turkey as the star!! These little links are great to work with and easy for many meals or recipes. We started by frying up the turkey after we removed them from the casing, this lets the turkey get a nice crumbled effect and browned up gorgeously. Once browned the turkey is removed and next into the pan is the red pepper and onions. Once the vegetables are tender, they are removed and the hash browns are added from frozen to brown up and thaw while you get the rest of the ingredients together. The turkey, veggies, hash browns and cheese are then tossed together and place in a prepared pan. A simple whisk of eggs and milk with Tabasco and powdered garlic is your final step before assembly. If making ahead I would keep the turkey and veggies separate and in a prepared 9×13″ pan but not adding in the liquid until ready to bake. A final grating of cheddar cheese on the top and off it goes into the oven to bake!! 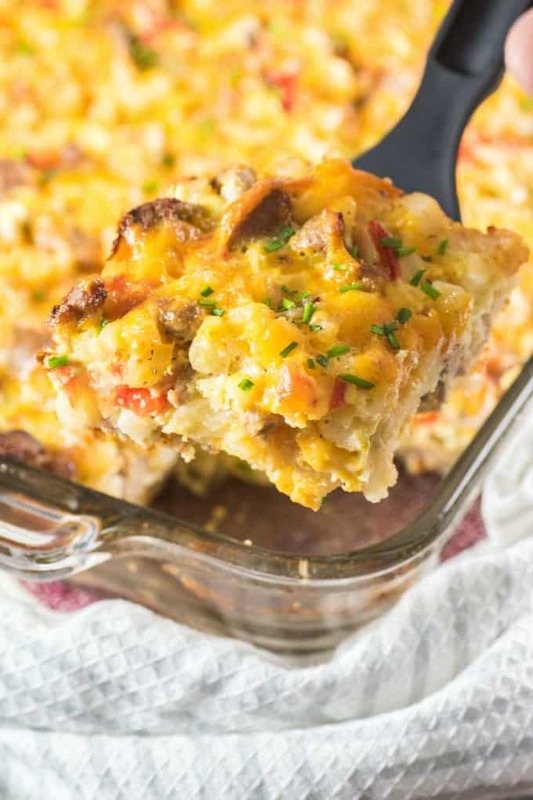 A breakfast casserole like this would take about 40-45 minutes but check the center to make sure the egg is cooked through. If it browns too much, (mine was just fine), you can foil it for the last few minutes to make sure it is cooked. Let it rest for 5-10 minutes before slicing so that is will have time to set. I have not personally frozen this particular casserole but the rule of thumb is that they have to be baked ahead of time. Never try to freeze a raw casserole as it will get runny and separate. Once frozen, thaw in the refrigerator overnight. Then bake at 350F watching closely for 25-30 minutes or until heated through. You may want to foil this again to prevent it from over browning. Cooking a whole turkey for the holidays or anytime for that matter, is easy!! We like having one for a lovely Sunday dinner! Let me help you with this post, Turkey 101 that has simple tips and tricks to get the best turkey ever. A turkey just needs some simple prep time and then the oven really does all your work. You can get more elaborate with seasonings, brining, stuffings and more but keeping it simple still provides you with an amazing meal. If you have people with dietary concerns a whole turkey is gluten free, lean, healthy and also economical to feed a crowd. The leftovers alone are why I love cooking a turkey. I love making a homemade turkey stock also, so easy and your house smells wonderful again. What to do with leftovers? Wow, I love having this great lean protein to work with after the big day!! You can add leftover turkey to recipes like Curried Turkey Pot Pie, Leftover Turkey Potato Hash, and Turkey Cheesy Alfredo Casserole. 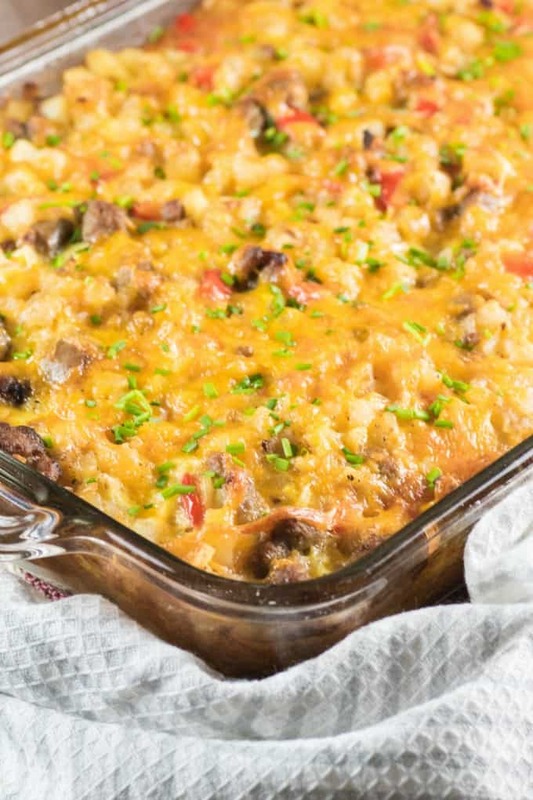 What to Serve with a Breakfast Casserole? 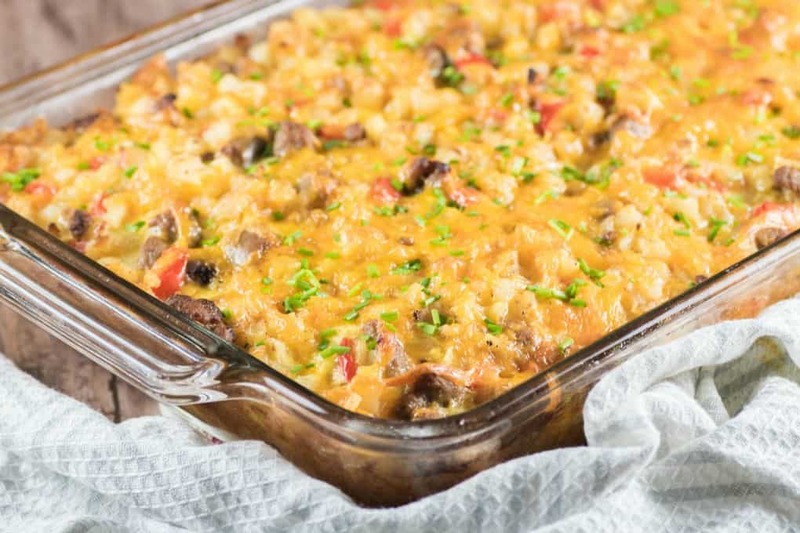 Adding in turkey to this casserole makes it a perfect meal but what do you serve with it? If it is for brunch I love to serve a fruit salad or a tray of fruit. A lovely fresh salad works great too!! There are so many alternatives to what you can put in a salad too. A salad with wonderful spring ingredients is perfect for this time of year too. You could also serve up a lovely banana bread, muffins, toast or scones. I truly can’t wait to make this again!! 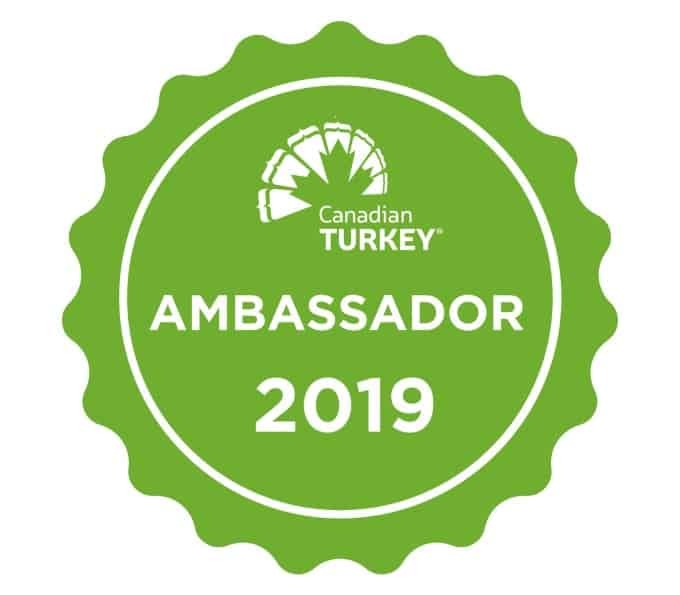 Come and follow Canadian Turkey for more recipes and join in on the fun on Facebook, Twitter, Instagram, Pinterest and YouTube. 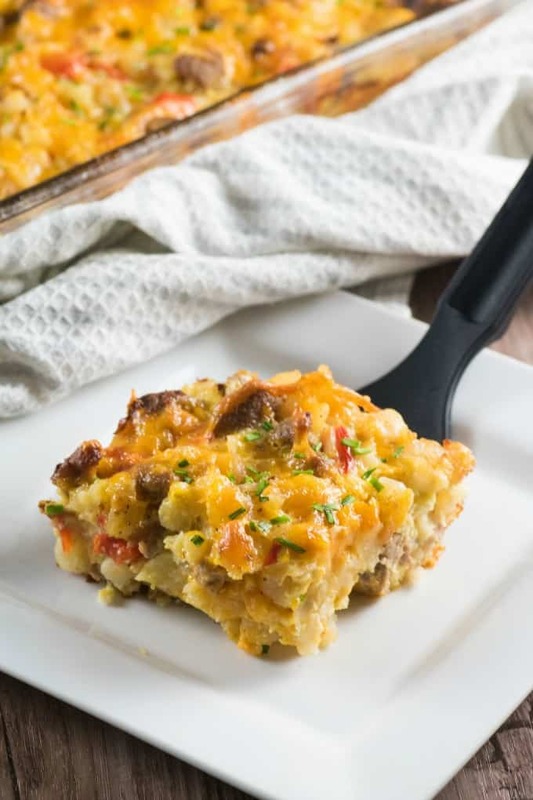 This amazing Turkey Sausage Hash Brown Breakfast Casserole is perfect for not only Easter but great for Mother's Day, Father's Day, or anytime you are wanting a great brunch! Spray a 9x13" casserole dish and set aside. 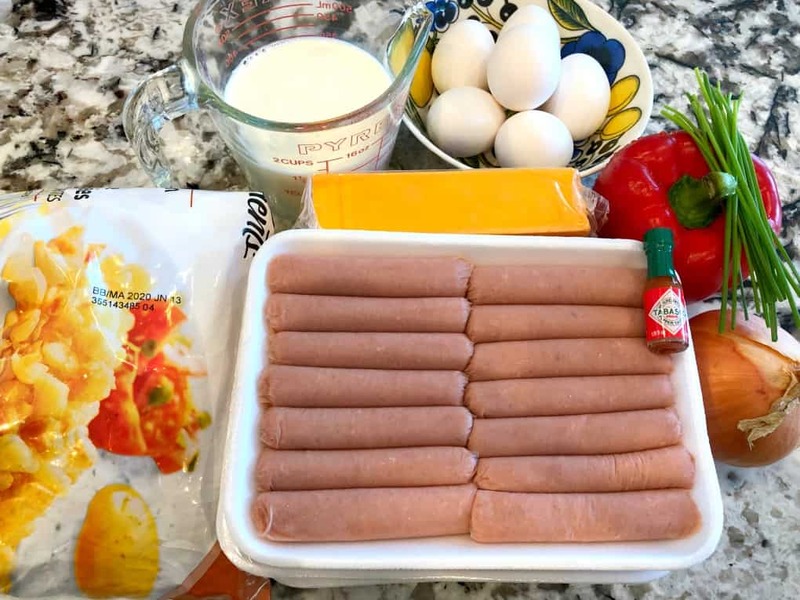 Remove turkey sausage from their casings and cook in 1 Tbsp. olive oil in a large non-stick fry pan, season with salt, pepper and 1/2 tsp. onion powder. Cook until browned and cooked through. Remove from pan and place in a large bowl. 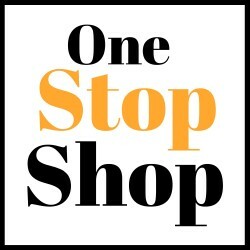 Add the other Tbsp. olive oil and saute onion and red pepper, season with salt and pepper. Cook until translucent and tender, do not brown. Remove to the bowl with the sausage. Cook hash browns according to package until browned and heated through, season with salt and pepper. Toss in bowl with sausage and vegetables. Add 1 1/2 cups cheese and toss well. Pour into the prepared dish. Meanwhile preheat oven to 350F. Whisk together milk, eggs, garlic powder, Tabasco sauce and 1/2 tsp. salt. Pour evenly over the turkey mixture. Top with remaining cheese. Bake 350F for 40-45 min. Let cool for 5-10 min., garnish with chives, then slice and serve. If making ahead of time have the sausage, veggies, and hash browns prepped and cooked. Pour them into the casserole with the cheese and cover. Then before going in the oven pour on the egg/milk mixture and bake. Can also be frozen, thaw in refrigerator and then bake to warm through, 350F for 20-25 min. Lasts up to three days in the fridge once baked. Wow, this looks so tasty! I love that you used turkey sausage as an alternative to regular pork sausage! Yum! I do like a good casserole in the morning. It helps when you can prepare it ahead of time. This would be perfect to our tomorrow’s family brunch! Look amazingly good! 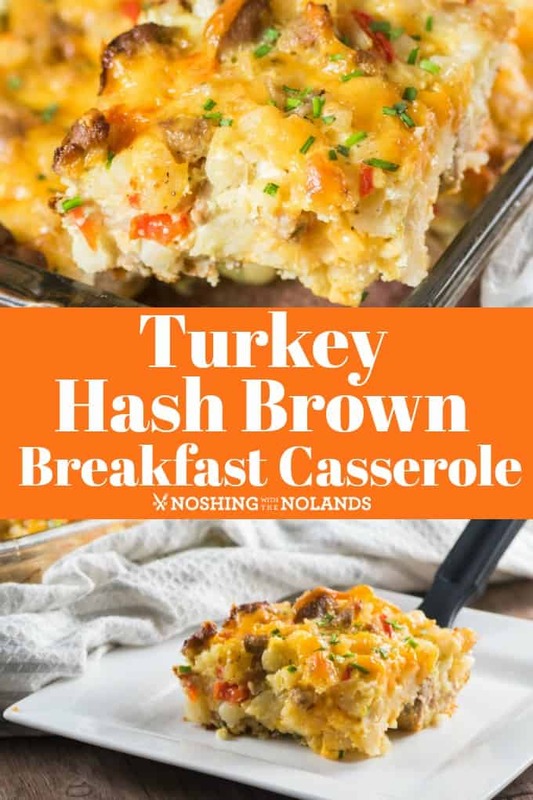 I’d love to make this for a holiday brunch. It looks really good and love that they are using turkey sausage! I am not kidding you. Yesterday, I got a few packs of raw sawsage as it was on sale. I decided to get it and freeze. Now, You gave me the idea for tomorrow’s breakfast. Bravo and thank you! This is such a delicious, hearty breakfast. I always make it a point to give my family healthier and more filling breakfasts because we all need the energy to jumpstart our day! This is so easy to make! And it looks so good too. I need to try this, yum!